Proverbs 3:9–10 Honour the LORD with thy substance, And with the firstfruits of all thine increase: So shall thy barns be filled with plenty, And thy presses shall burst out with new wine. 2 Corinthians 9:17 Every man according as he purposeth in his heart, [so let him give]; not grudgingly, or of necessity: for God loveth a cheerful giver. 1 Timothy 6:17-19 Charge them that are rich in this world, that they be not highminded, nor trust in uncertain riches, but in the living God, who giveth us richly all things to enjoy; That they do good, that they be rich in good works, ready to distribute, willing to communicate; Laying up in store for themselves a good foundation against the time to come, that they may lay hold on eternal life. Proverbs 13:22 A good [man] leaveth an inheritance to his children’s children: and the wealth of the sinner [is] laid up for the just. Proverbs 21:20 [There is] treasure to be desired and oil in the dwelling of the wise; but a foolish man spendeth it up. Isaiah 52:3 For thus saith the LORD, Ye have sold yourselves for nought; and ye shall be redeemed without money. Acts 8:18–20 And when Simon saw that through laying on of the apostles’ hands the Holy Ghost was given, he offered them money, Saying, Give me also this power, that on whomsoever I lay hands, he may receive the Holy Ghost. But Peter said unto him, Thy money perish with thee, because thou hast thought that the gift of God may be purchased with money. Ephesians 4:28 Let him that stole steal no more: but rather let him labour, working with [his] hands the thing which is good, that he may have to give to him that needeth. The Bible is just full of verses about money. 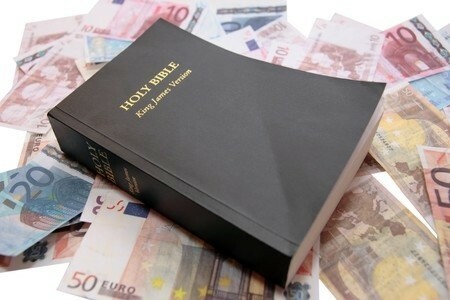 Can you share just one KJV Bible verse about money in the comments below? Related reading for you: Is Money the Root of all Evil? We know that labor is good when it is done to glorify God. He allows us the ability to make wealth(Deut 8:18). We should not labor for the end purpose of being wealthy, but that the wealth would further God’s Kingdom. Sometimes this nuance for the Christian, myself included, gets lost in collective bargaining. You are exactly right DocReits. Thanks for adding one — well, two. Very nice! Previous post: What Does The Bible Teach About Prisoners? Next post: What Is The Biblical Definition Of Adultery?